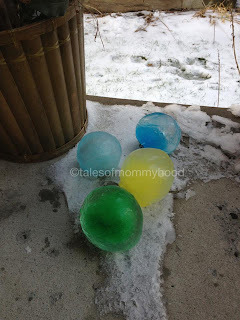 Tales of Mommyhood: Winter Crafts - Coloured Ice "Balloons"
Winter Crafts - Coloured Ice "Balloons"
if you like this idea, please pin it! 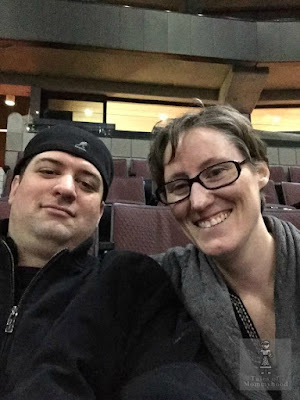 A few months ago, a friend sent me a link to a facebook photo that looked like a really neat activity. What you do: fill balloons with coloured water and freeze! Remove the balloons and you have some pretty neat looking outdoor decorations. If using a funnel, fill a few bowls with water and add desired colours. Insert the tip of the funnel into the balloon and fill with water; knot the balloon and continue until you have the amount of balloons you want. Place outside (overnight is great) in below zero temperatures and in the morning cut off the balloons and place the "decorations" where you want them. I didn't have a funnel, so we did the no funnel method; however, I think the colours would be much brighter by colouring BEFORE adding to the balloons, so next time we do it I will make sure I have a funnel! Enjoy - super easy and affordable activity to fill a small bit of time on a cold, cold day....great for this week if your in Ottawa! Very cute! i have never heard of doing this before. What a great idea...simple but lots of impact. I bet kids and adults both love the finished product! I love it, That is such a cute idea! It is so cold where we are that I think we *need* to try this! Thanks for the post!! That looks like a lot of fun and it's going on our "to do" list when my son is older. Thanks for sharing! I think I'm going to do this with my girls! They will love it! What a cute idea! I wish it got cold enough to do this where we live. It does, but usually just for short times. Would be fun to try it during one of those short times. I would love if you would share this at my link party. I think these Ice Balloons are a fabulous idea and I may try it next winter. Thank you for telling us how to make them and showing photos of them. They are really a showstipper!